The global reach of the Challenger Learning Center at Wheeling Jesuit University recently extended to a new school in India. 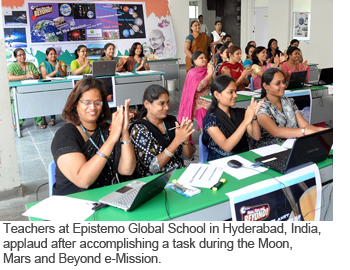 Through videoconferencing, 30 teachers at Epistemo Global School in Hyderabad, India, took part in the Moon, Mars, and Beyond e-Mission™ Saturday. The teachers connected at 4:30 a.m. Eastern time with Kathleen Frank, assistant director of the Challenger Learning Center and head of the e-Missions program. In Moon, Mars, and Beyond students play the role of specialists at mission control helping NASA find and rescue a lost spaceship that is orbiting the outer planets. The students must use a variety of math skills to locate the ship. Saturday's mission with the teachers will prepare them for future missions with their students and the Challenger Learning Center. Epistemo Global is the flagship venture of Samaikya Educations, a team of entrepreneurs, academicians, and technocrats with a vision of providing world class, holistic education. The school has about 200 students and 30 teachers. Its sister school, Vikas—The Concept School, is expected to connect with the Challenger Learning Center as well in the future. Frank said the teachers dressed in traditional Indian attire for the mission because they felt it was such a special occasion. They also decorated the room with Moon, Mars, and Beyond materials. "This new school is energized to do great things," Frank said. "All participants in the actual mission were very enthusiastic and gave rounds of applause at every reading. Their gratitude was genuine and heartfelt. They were all very excited to have this educational opportunity with us." "The teachers of Epistemo Global had an incredible experience working with Commander Frank, and probably this is the best training they had ever since the inception of the school. We really enjoyed those rare space videos that made the project so close to reality. The teachers rediscovered their innate talents, and the teamwork no doubt improved their interpersonal skills in a tremendous way. EG salutes the dedication of the staff at Challenger, who took the pains to conduct the entire program flawlessly at the wee hours of the day." India is one of 15 countries to which the Challenger Learning Center has expanded its e-Missions. In these distance learning videoconference simulations, students connect with a flight director at the center and use their problem solving, math, and science abilities to work their way through a scenario fraught with crises. Each year more than 750 video connections are made to classrooms around the world. The Challenger Learning Center is one of 48 centers worldwide established by the Challenger Center for Space Science in memory of the space shuttle Challenger. More than 30,000 students fly missions each year either at the Wheeling facility or through distance learning. The center has been honored nine years at the annual national awards conference in three categories: Most Students Served, Most Missions Flown, and Most Teachers Trained.